Following the recent wave of recent controversial chalkings at the University of California, Santa Barbara, third-year theater and feminist studies double major Alessandra Albanese is aiding the campus culture cleanup with a scholarship fund for the arts, the UCSB Commitment to Diversity Award. The $500 annual scholarship, awarded to students who best promote diversity through artistic mediums, is a response to the chalkings that appeared early last month on the walkways surrounding the theater and dance building — though chalkings were found in multiple locations on campus. Among the “[Donald] Trump 2016” markings seen throughout campus, “Build a Wall Now” and “Mexicans Go Home’” were two additional sentiments found scrawled outside the studio theater. It was the “Make America Great Again” chalking — which Albanese personally erased — scrawled across a memorial plaque honoring UCSB theater student Gregory D’Amico, that ultimately inspired Albanese to establish the scholarship fund. The Indigogo.com campaign, set to remain open through June 1, raised $1,110 in its first four days. The $5,000 goal, funded independently of the university, will cover the annual $500 grants awarded to qualifying students in any major with an artistic emphasis. The two April instances of chalking sparked widespread controversy during the peak of admissions season and have prompted responses such as the campus town hall meeting and second student-run Million Student March. Cleverly dubbed the #chalkening on Twitter, the wave of pro-Trump messages and minority slurs has swept other university campuses across the nation as well. What began as conservative backlash to Emory University students’ complaints that “Trump 2016” chalkings made them feel “unsafe” — according to the New York Times — has erupted into near-anarchy after Daniel Scavino, director of social media operations for the Trump campaign, reposted tweets of chalkings on the University of Wisconsin campus. 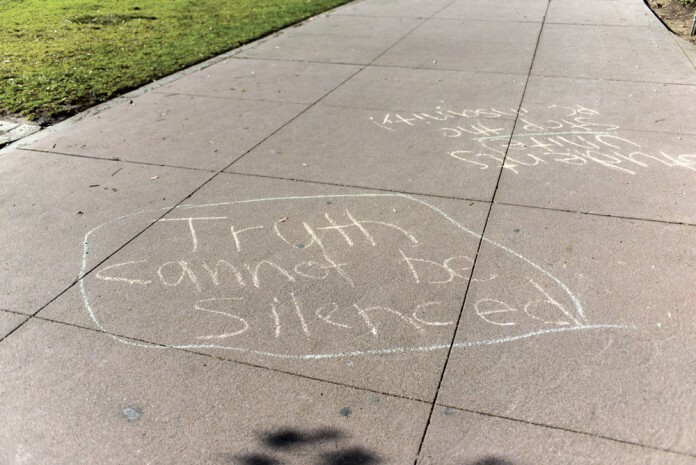 Just two days before UCSB’s second chalkings were discovered, UC San Diego reported similar instances of chalking on their campus. On April 12, UCSD students gathered for Chalk Back, a three-hour demonstration that gave students and faculty an opportunity to voice their opinions regarding the April 8 chalkings and administration’s response. Student groups also submitted a list of 33 demands to UCSD administration that morning, according to the UCSD Guardian. As the argument in defense of chalking has turned the preservation of free speech, Albanese made clear that the Commitment to Diversity Award is not intended as a denouncement of that right.